Donald Trump’s tweets are going to a fiery place after a bizarre new Twitter account began sharing videos of the infamous microblogging posts being printed and then set alight by a robot. The account automatically tweets as soon as Donald Trump posts something on Twitter. It then shares a video showing a robot printing Trump’s tweets before burning and dumping a hardcopy of the microblog. The tweeting times coincide with Trump’s account and the words being printed are visible in the videos, proving the robot really is going to all that effort to troll Trump. Nothing is known about who is behind the account, which is following 51 accounts associated with a range of industries. 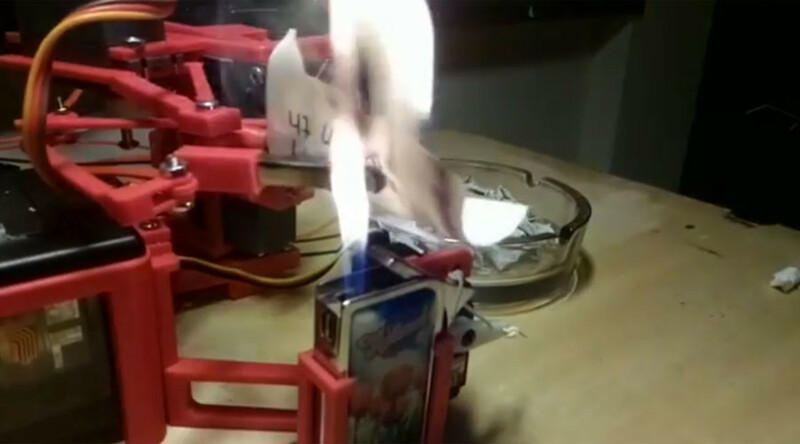 A YouTube account for the robot contains a video in which it prints and burns the words “Not scared of fire. I live in the cloud,” and a message to Reddit, stating its mission to print and burn Trump’s tweets. Trump has not responded to the account, which is sure to have a flame at the ready if he ever does.